Los Amigos Beach Club is undoubtedly one of the best equipped resorts in the region and promises the perfect family vacation. 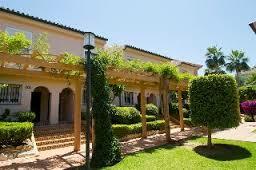 Or is ideally located to form the base for your own golf tour. Almost an Andalusian village in itself, Los Amigos combines beautiful accommodations with a range of facilities including stylish indoor and outdoor pools, tennis courts, a clubhouse with restaurant and even its own bowling green. 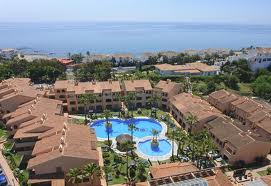 With attractive landscaped gardens, you might consider never leaving the resort, however, there is much to see in the surrounding area; the colorful seaside market town of Fuengirola, affluent Puerto Banus and the cobbled streets of Mijas are just some of the delights within easy reach. 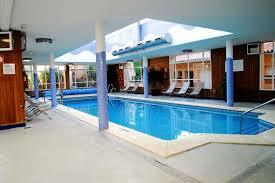 With a supermarket and restaurant on site as well as outdoor and indoor pools and just 300metres to the beach. 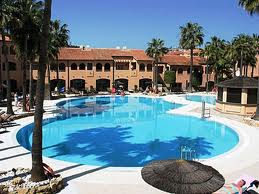 Just 2kms from El Chapparal Golf Course, 6kms to the town of Fuengirola and 9kms to Mijas Golf. 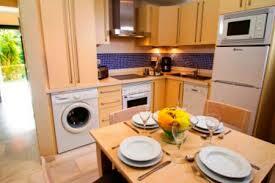 Choice of studios, 1 bed or 2 bed apartments and prices from just 12€ per person per day!